If you’ve been thinking about getting plantation shutters, you might be curious about the difference in sizes of louvers you could choose. Shutter louvers from Hunter Douglas come in 2-1/2″, 3-1/2″, or 4-1/2″. Depending on the style, view, or architectural feature you’re looking for, truly, louver size is often a personal preference. If you’d like to see firsthand how they stack up, speak with a trained Windows & More specialist here in the Lake Ozark area. We’ll be happy to help you decide which size is right for your window. Plantation shutters offer curb appeal, no matter the size of louver you choose. As you think of the size of louver you want, be sure to consider the design style of your home, the outside view, and your desired level of natural lighting. 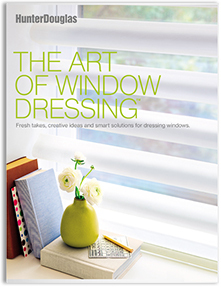 Consumers often like the 2-1/2″ size for windows that are three feet high or less. The 3-1/2″ larger-size louver is the most requested of all louver sizes. Looking through this size louver provides a dramatic difference in what you see and how much natural light flows into the room. This is an ideal size if the majority of your windows are 36″ high or greater. The largest size, 4-1/2″, provides the fewest number of louvers for any given window. It is popular for taller windows and rooms with oversized ceiling heights. Remember that smaller louver sizes might look heavy at the window, where a larger louver size can add aesthetic value to a room. 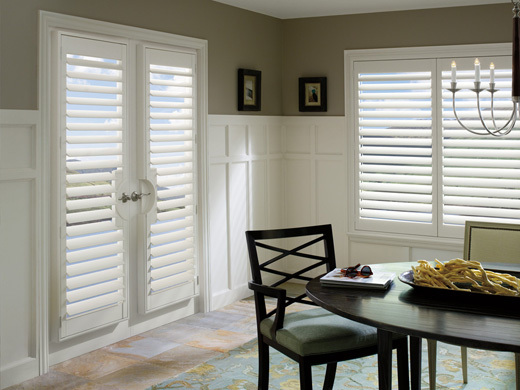 Hunter Douglas offers numerous shutters; you’re bound to find one that will work perfectly in any room of your home. Selections include Heritance® Hardwood Shutters, which are handcrafted to accentuate the inherent characteristics and colors of natural wood; NewStyle® Hybrid Shutters, which combine a wood style with the strength and stability of man-made materials for beauty and durability; and Palm Beach™ Polysatin™ Shutters, which are constructed from a UV-resistant polysatin compound that is guaranteed not to fade, crack, or warp.